Made with 1570 AISI-standard stainless steel, our 2.5mm diameter 1×19 construction wire rope is built to last and undeniably attractive. We can provide you with rope of this type in whatever length you require, along with the tools and fittings needed to use it effectively.Read further to find out more about the 2.5mm 1×19 stainless steel wire rope. The most appealing asset of this 2.5mm 1×19 stainless steel wire rope is that the stainless steel strands from which it is constructed will not suffer the usual wear and tear associated with outdoor and maritime use. Rust will be rebuffed and the shiny surface will be simple to maintain, while looking good for longer. Load limits for this wire rope are set at 525kg, with a breaking force of 5.15kN rated for this particular 1×19 construction rope. This makes it sturdy, while also ensuring that it is thin enough to appeal to those who are more interested in its decorative properties. At Rope Services Direct, our stainless steel rope range does not start and end with the 1×19 construction products. 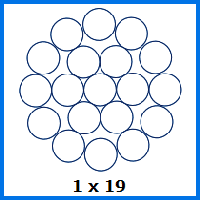 You can choose strand configurations of many sorts, from durable 6×36 rope to non-rotating 18×7 rope. We also offer compacted wire rope in various configurations if required. We know that having the help of an experienced wire rope specialist when compiling your order at RSD is important. If you need to talk to our team, you can call them direct on 01384 78004 or drop us an email for a response that will be sent out as quickly as possible. 2.5mm 1x19 Stainless Steel Wire Rope Overall rating: 5 out of 5 based on 6 reviews.